Those who were letdown by last year’s bloated “The Hobbit: An Unexpected Journey” from Middle Earth maestro Peter Jackson (I’m in that camp), can breathe a sigh of relief – this sequel is better. It’s more streamlined and less meandering and has some dazzling action. But it still doesn’t tell us too much about its titular character. Maybe that’ll come next year, when the third and final film comes out. 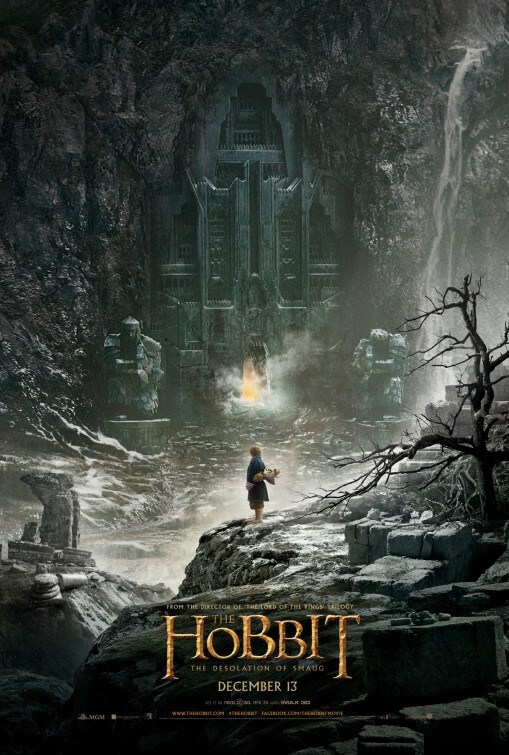 It’s possible though, that like “The Two Towers” from Jackson’s “Lord of the Rings” trilogy, this thrilling and enjoyable installment could be the best of “The Hobbit” films. 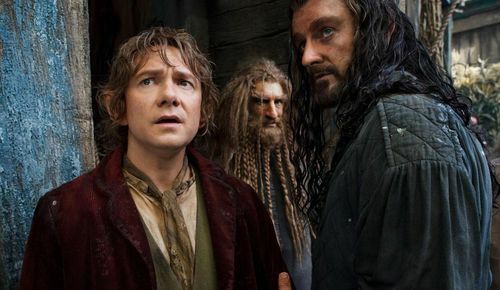 “The Desolation of Smaug” reunites us with the comedic Company of Dwarves (I’m not gonna list them all), led by Thorin Oakenshield (Richard Armitage), accompanied by our lone Hobbit, Bilbo Baggins (Martin Freeman) and occasionally guided by wizard, Gandalf (Ian McKellan). They are still walking and running, becoming closer to the Lonely Mountain, where the dwarves hope to reclaim Erebor from the greedy dragon Smaug (voiced by a wonderfully preening Benedict Cumberbatch). Gandalf is drawn away from the sojourn to investigate the mysterious presence of a Necromancer (also voiced by Cumberbatch), leaving Bilbo and friends to deal with the giant spiders in the Mirkwood forest and the arrogant Elvenking Thranduil (Lee Pace), as they eventually arrive at the humble Lake-town, overseen by its scrupulous Master (a welcome Stephen Fry). At times, a certain ring comes in handy for Bilbo, something he becomes increasingly protective of. Along the way, the group encounter several allies who vary in their level of committed helpfulness. The moody shapeshifter Beorn (Mikael Persbrandt) helps them allude savage Orcs by offering shelter. 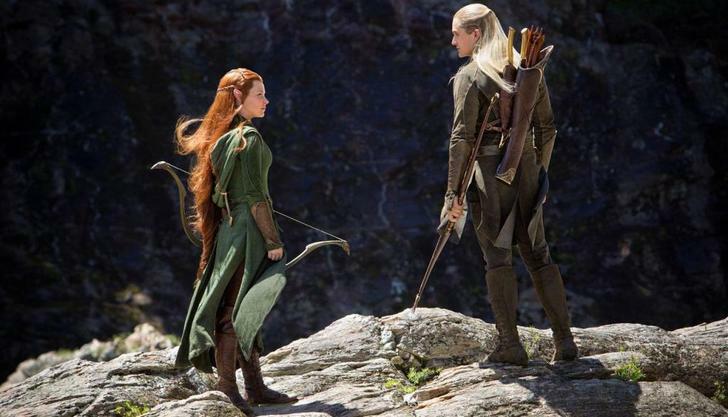 Two acrobatic elves, the compassionate Tauriel (Evangeline Lilly) and a reluctant Legolas (Orlando Bloom), using their archery skills to take out Orcs, allowing the gang to escape Elven captivity. 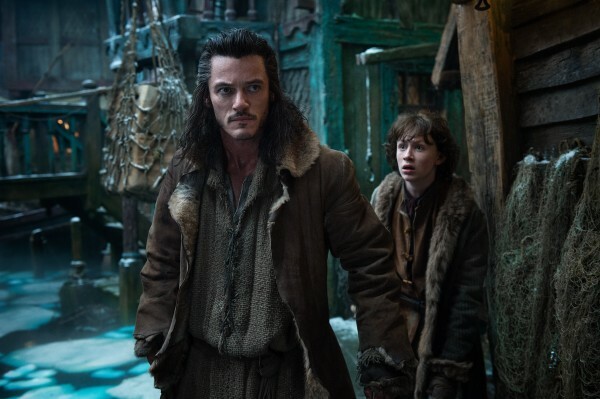 There is also a moody boatman named Bard (Luke Evans) of Lake-town, who provides safe travel and unconventional weapons for the group. At one point, Gandalf is also allied with fellow wizard, Radagast (Sylvester McCoy), who we met in “Unexpected Journey”, to offer his assistance and exposition. As rumblings of a Middle-Earth war increase, fueled by the Necromancer and employed by Orc leader, Azog (Manu Bennett) and Orc enforcer, Bolg (Lawrence Makoare), it becomes clear how crucial Bilbo methods factors in. 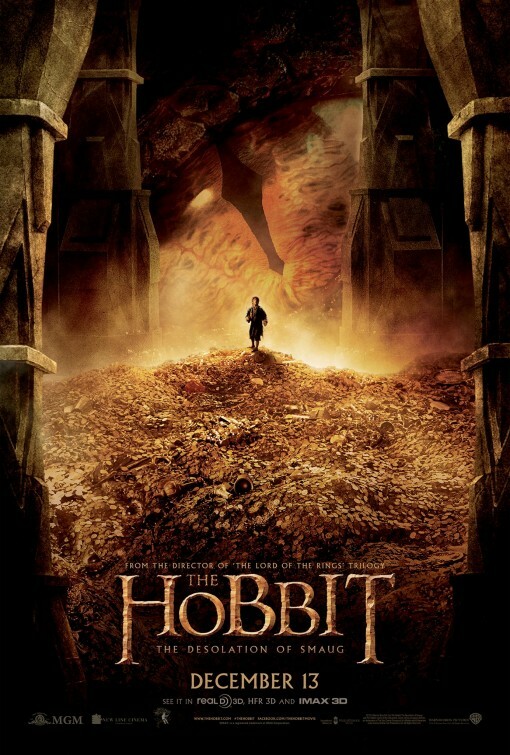 Chosen by Gandalf because Hobbits are known for their thievery, Bilbo must steal the Arkenstone – a powerful gem that will give our heroes the upper hand – from Smaug, as he slumbers in his mounds of gold. Like the last film, this sequel has its share of deviations from the source material, but that’s to be expected when adapting a 310-page novel into three 3-hour movies. Most of the ancillary fluff in “Unexpected Journey”, culled from Tolkien appendages and inserted by fanatical fanboy Jackson, just didn’t work for me. It all felt quite cumbersome and unnecessary, even though many embraced it. Thankfully, “Smaug” doesn’t feel that way for me. It cruises along at an entertaining clip with some of the best choreographed action I’ve seen all year and has one the coolest cinematic fire-breathing dragons since 1981’s “Dragonslayer”, which kept me from leaving the theater in a catatonic state as I did last December. As long as these movies are though, you’d think we’d actually get a chance to know the characters a little better, especially Bilbo. Although, it would appear to the curious Hobbit, right now the story is more focused on Thorin. The thing is, there’s just too many characters to keep track of and I’m hesitant to get invested in any of them, since they probably won’t be around very long. Expectedly, Jackson does what he can to link “Smaug” to his “Lord of the Rings” trilogy – and why not?. This is specifically noticeable with the inclusion of Legolas, who wasn’t even in the Tolkien novel. It’s nice to have Bloom back, as we meet Legolas’s father and learn who the intense archer has the hots for. Which brings us to the character of Tauriel, a Silvan Elf who wasn’t in any of the Tolkien books, co-created purposefully by Jackson and Fran Walsh to inject a female presence into his male-dominated movies. I’m glad they did. As Tauriel, Lilly is natural and easily likeable; showing both a reckless and ruthless side as well as a romantic flirty side, as she falls for the imprisoned dwarf, Kíli (Aiden Turner), nephew of Thorin. Out of all the characters in “Smaug”, Tauriel and Smaug himself, turned out to be the most memorable to me. Tauriel is a refreshing addition to the cast and the combination of the velvety sound of Cumberbatch’s voice and creative design work is quite impressive. Of course, knowing Cumberbatch voices Smaug going in, I couldn’t help but think about “Sherlock” during the encounter between Freeman’s Bilbo and the dragon. The cameos in “Smaug” are aplenty and often quite indulgent. There’s a winking Peter Jackson, walking in the rain during the film’s opening in the human town of Bree. There’s literally a screenshot of Cate Blanchett as Galadriel, so I don’t know if that counts. And there’s a blink-and-you’ll-miss-him appearance by Stephen Colbert, credited as: Laketown Spy. That’s right. As usual with Jackson’s Tolkien films, “Smaug” excels on a technical level, offering some great sound design, detailed art production and, once again, a captivating score from composer Howard Shore. Regardless of the flaws “The Hobbit” movies have had so far, with this kind of artistry going into an epic fantasy endeavor, I’m still on board. I’m glad a movie in this genre is being made, but I justifiably have my reservations. I witnessed something funny occur several rows in front of me at an advance screening. A gentleman slapped his hand on his arm rest in frustration immediately after the abrupt ending. I was baffled. For his sake, I’m hoping this reaction was because he enjoyed the movie so much and couldn’t stand seeing it end. I hope it wasn’t because he forgot there’s another three-hour opus, “There and Back Again” coming to theaters next December. Good review David. It definitely could have been cut-down by 20 or so minutes, but for what it’s worth, I had fun with this movie. I’ve been surfing on-line more than three hours as of late, yet I by no means found any fascinating article like yours.